Genius Brands International Inc (OTCMKTS:GNUS) locked in gains of over 30% on above average volume due to a shareholder update from the Chairman of the Board and Chief Executive Officer. The stock is currently trading at $1.30 which is far below its 52-week high of $3.35. GNUS expects to be cashflow positive for Q1’2016 and also expects this trend to continue. It has seen a significant improvement in its financial performance witnessing high double digit to triple digit growth. Genius Brands is hitting an inflection point and expects to see a hockey stick growth moment. The company continues to invest in several brands and characters like Llama Llama, Baby Genius, Thomas Edison’s Secret Lab, Spacepop, Secret Millionaires Club, and Two. It has a vast network of partners with big names like Comcast, Sony, Netflix, Public Television, YouTube, and NCircle. The CEO presented a shareholder update letter where he covered several areas. First he opened up with Marvel and how the company started trading at $1.43 / share and eventually was bought out by Disney for $4.24 billion. Mr. Heyward has exciting thoughts about Genius Brands, although he does not expect to reach $4 billion anytime soon. There are plenty of developments going on at Genius Brands that have the potential to propel the company to the next level and give investors a reason to be excited about the company again. First, the GNUS has $6 million in cash which is equivalent to 40% of its current market cap. It expects to see a significant increase in cash due to license fees and negotiated contracts valued at minimum of $6 million. 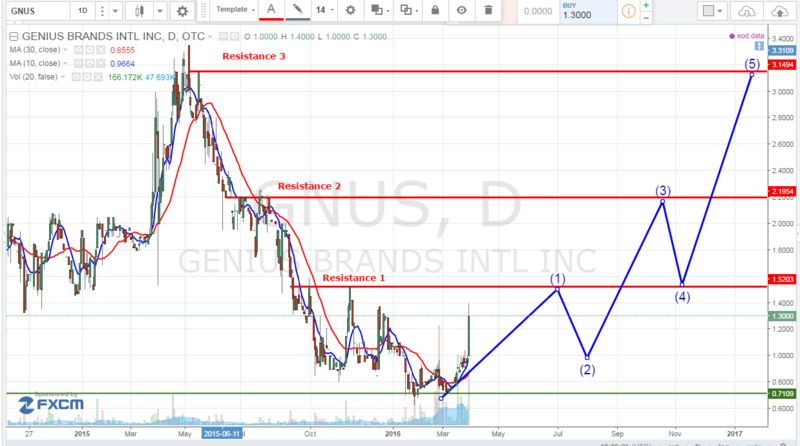 Genius Brands International Inc (OTCMKTS:GNUS) royalties have grown over 58% year over year and poised for another year of significant growth as the company has a slew of new properties. In addition, its television and home entertinament segment so revenue growth of over 240% from $0.11 million in 2014 to $0.4 million in 2015. It also announced that during first quarter of 2016 it has delivered an entire series of Thomas Edison’s Secret Lab which is set to trigger even more sales and contracts. The company announced that it had returned to profitability in 2015 and recorded an increase of $0.3 million in net income year over year from a loss of $0.25 million in 2014 to a profit of $0.05 million in 2015. Gross profit almost doubled from $0.43 million in 2014 to $0.83 million in 2015. GNUS is currently trading at a $15 million market valuation. The company has performed well over the past year and has seen significant growth. It has over $6 million cash which represents 40% of its market cap value. In addition, the company has reported profitability and will likely continue to grow its bottom line. GNUS expects to be cash flow positive meaning shareholder dilution will likely be minimal. We will be updating on GNUS when more details emerge so make sure you are subscribed to Microcapspot so you know what’s going on with GNUS. Disclosure: we hold no position in GNUS either long or short at the publication of this article.